She studied voice, music and musicology in Douai and Paris, at the Versailles Baroque Music Centre Opera Studio and at the Sorbonne. Her repertoire spans from Baroque to Classical to contemporary and light music, in recital and on the operatic stage. She has worked with Hugo Reyne, Emmanuelle Haïm, Jérôme Corréas, Jean Tubéry and Marc Minkowsky, Claude Lavoix, Catherine Cournot, Emmanuel Strosser, Nicolas Stavy, Laure Colladant, Arthur Schoonderwoerd, Christine Icart, and Carpe Diem, oboist Jean- Pierre Arnaud’s ensemble... She has also a keen interest in music theater. 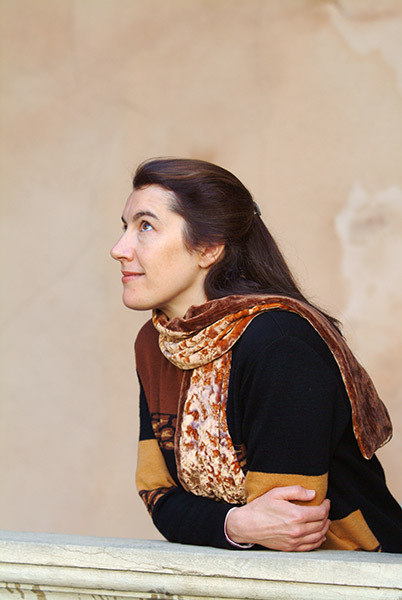 In 2003, she sang the title-role in Michèle Reverdy’s Médée at the Lyon National Opera (a Mandala recording) and the role of a young Hector Berlioz in C. Wasselin & G. Condé’s Les Orages Désirés (a Radio-France production). She has made several recordings : Joseph Kosma songs with harpist C. Icart (Zig Zag Territoires), Louis Aubert Mélodies with pianist C. Lavoix (Maguelonne), art songs on poems by Jules Verne with E. Strosser (Mirare), La Simphonie du Marais, Carpe Diem, La Fenice, Le Trio di Bassetto, Les Musiciens du Louvre, Les Talens lyriques, Sagittarius, Akadémia and Le Parlement de Musique. In 2005, she premiered Passions Baroques, a Péniche Opéra production, in collaboration with E. Haïm and Stuart Seide, and Cantates de Bistrot by Vincent Bouchot, after J-M Gourio’s satirical show Brèves de Comptoir.